Historical Biographies, Nova Scotia: James Wolfe (1727-1759). At the vicarage in Westerham, Kent, on the 2nd of January, 1727, our hero was born. His father was an army officer, Edward Wolfe; his mother, Henrietta, daughter of Edward Thompson, was from Marsden, Yorkshire. At the time of the birth, his father was 42 years of age and his mother, 24.1 Soon after, the family moved to the building which was, in the early part of 19th century, to be called the "Quebec House." Within a year James was to have a younger brother, Edward. It was here, at Westerham, that the Wolfe boys, described as being both delicate and sensitive children and whose health was precarious, grew up in the loving care of their mother. About 1738, presumably because of the requirements of the father's military career, the family moved to Greenwich. Because of the conspicuous military movements at Greenwich and of the hearing of his fathers's exploits as a soldier under Marlborough, James, at an early age, formed a desire to enter army life; and, he wanted to do so at the earliest opportunity. At the tender age of 13 years he was to join his father's regiment. The War of the Austrian Succession (1740-1748) shortly thereafter broke out and the regiment was apparently going to board vessels for Europe. Already a martyr to illness, just as the fleet was sailing with his regiment, the 14 year old James had to be put ashore, seriously ill, and returned to his mother. He apparently recovered and in November of 1741 (age 14), he was appointed Second Lieutenant in his father's regiment of marines, the 12th Regiment (Durourels), and in April, 1742, embarked with his regiment for Flanders. For advancement in the military, there is nothing like a war, especially for the young officer who is personable, industrious and has some connections. At the age of 16, in 1743, James was made Lieutenant and an adjutant. In 1744, he was made a captain in the Fourth (Barrel's) or King's Regiment of Foot. Also, I should mention, that in October, James was to receive news that his brother Edward, who had joined the army to be in company with James, and whom he idolized, died after a few days' illness from consumption. In 1745, Wolfe's regiment, at least in part, was called home so to deal with a rising problem. In fact he was sent to Scotland. Scotland though joined to England by the Union Act of 1706, had long been a land of people, who, while intensely loyal to their clan chieftains, were resistant to central authority, especially where that authority was English. In 1745, a new threat came to the royal Hanoverian line, and, in particular, to the Protestant king then on the English throne, George the Second. The threat was in the form of Charles Edward Stuart (1720-88) who in that year came ashore in the Scottish Isles with the express intention to take what he calculated was rightfully his, the English throne.3 This story, I tell elsewhere (see Culloden); for our purposes here we merely state that James Wolfe was very much part of these stirring times when the Scottish clans devoted to the old order launched a rebellion; one which in its incipient stage showed surprising success; but one which ultimately the English were to brutally put down. James Wolfe was present at the Battle of Falkirk which occurred on 17 January 1746; it was to be the last victory for the Highlanders. The core of the English army had been brought over from Europe and were still on the road marching up to Scotland, when, in January, General Hawley suffered his defeat at Falkirk. Three months later, however, on the 16th of April, 1746, the Duke of Cumberland caught up with Charles' army. The men of the loyal Scottish clans amounted to 6000 and were to face Cumberland's army of 9000, who were well disciplined and well equipped, and who had been hardened in the continental theatre. The face off occurred on Drummossie Moor near Culloden, 5 miles from Inverness. During this battle, Wolfe was the aide-de-camp to General Hawley. Within an hour Cumberland was to bring the Scottish rebellion to an absolute end. Over 1,000 highlanders were slaughtered, and, on Cumberland's orders, many more were butchered as they lay wounded and helpless. With the Scottish rebellion crushed, Wolfe returned back to the continent, there, to finish out the war (1740-1748). He was present at the battle of Val or Laffeldt, where Wolfe distinguished himself, the Official Gazette stating that he was wounded, and was publicly thanked by the commander-in-chief for his distinguished services. After the Peace, in 1748, Wolfe returned home bathed in glory, seven active campaigns under his belt, and, but yet only 21 years of age. He did not have much time in which he might bask in the admiration of his fellows and in the love of his family (especially, I dare say, his mother's love). He was sent off to Scotland with his regiment for garrison duty. 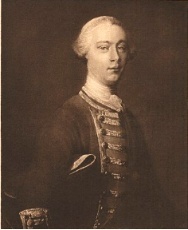 In 1749, Wolfe was made a major of the 20th Regiment. It is interesting to note that when he assumed the command at Stirling, he was to relieve Lieutenant-Colonel Edward Cornwallis. Cornwallis, as we can see from our larger story had been appointed Captain-General and Governor of the new settlement of Halifax. On the 20th March, 1750, Wolfe was officially appointed Lieutenant-Colonel of the regiment. He served in Scotland and England until 1758. During these years, when on furlough, he would take himself off to France and was to polish up his use of the French language, in which he was to became quite proficient.5 Wolfe also wrote military pamphlets, for example, in 1755, he wrote, "Instructions for the guidance of the 20th Foot should the French effect a landing." In 1756, a new war broke out between the English and the French, the Seven Years War (1756-1763), one which was to bring Wolfe to the pinnacle of his military career and to make him an English hero to be remembered for all times; one, which brought him glory; one, which brought him death. In 1757, the English leadership launched an attack directly on the French coast. It involved the cooperation of both the British navy and the British army. The attack on Rochfort was generally botched and the military leaders who returned were to attract much odium; James Wolfe, however, came away from the event unscathed, indeed he was one of the few who had distinguished himself at Rochfort. As a result, Wolfe was brought to the notice of the prime minister, William Pitt. Pitt had determined that the best gains in the war were to be made in America. On the 23rd of January, 1758, James Wolfe was commissioned as a Brigadier-General (for service in America only) and sent off with Amherst to attack Louisbourg, an event which is dealt with in another part of our history. "He was impulsive, but not rash; persistent but not obstinate; self-confident yet modest; aspiring but not vain-glorious; generous, hospitable and charitable, but not extravagant; stern yet gentle; ingenuous but not egotistic; free spoken yet courteous. If ever high honour, strict integrity and all the qualities which constitute a dutiful and affectionate son (his letters to his parents, written alternately almost weekly throughout his life, are models of affection), a true and constant lover, a sincere friend, a loyal subject, and a pure patriot, were combined with fearless valour, untiring industry and great mental capacity, they were combined in James Wolfe. Green, History of the English People , vol. IX, p. 203. Hart, Op. cit., p. 164. The Life of Major-General James Wolfe (London: Chapman & Hall, 1864), p. 487. As set out in The Life and Letters of James Wolfe by Beckles Willson (London: Heinemann, 1909) pp. 246-7.